Apartment in Barcelona ideal for a relaxing holiday away from the noise of the city center with all the necessary amenities and easy access to public transport. It’s beautiful terrace is the ideal place to relax after a day of sightseeing. It has elegant details in its decoration and the modern amenities will allow you to have a great stay in the city. It has one bedroom and one complete bathroom with shower. In one open space there are: living room with double sofa bed, dining room, fully equipped open kitchen. There is also a lovely terrace with table and chairs. Clean, light and airy apartment. Lovely terrace. Ideal location, very close to metro and buses. Market next door. Plenty of supermarkets near by. Met promptly by the key holder. Just one thing that would have made things a little nicer and that would be provision of washing up liquid, sponge, tea towel or drying cloth and few toilet rolls. Tourism license number : N/A (Only available for monthly rentals). The apartment ADN 41 is located in Sants area. Tourism license number: N/A (Only available for monthly rentals). Metro stop - 125 m.
Metro stop - 342 m.
Plaza de España - 0.40 km. Fira de Barcelona - 0.52 km. 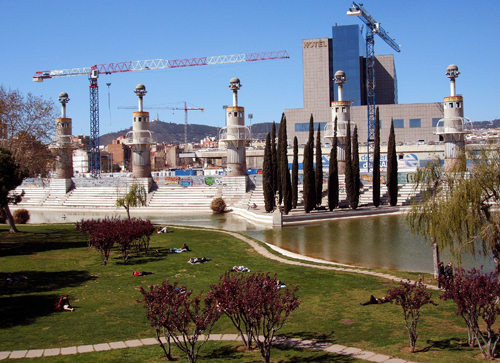 Foundation of Joan Miró - 1.65 km. The apartment is generally well maintained and necessary things during stay were provided. We only had aircondition malfunction during the first night which has been fixed the next day. And the elevator was out of service for one whole day so we needed to take the stairs with our things and kids but fortunately they were able to fix it before our flight out of the country. The location is good because it is located right beside hostafrancs metro station.Would love to book again this apartment. The apartment was nice but a bit small for a family with children. Despite being in one of the loudest streets in Sants, the apartment is surprisingly very quiet. Great place for a short stay in Barcelona due to its convenient location (metro stop just a few meters away). If travelling with small children please take into account that you will have to carry your stroller through a steep and narrow staircase at the entrance before reaching the elevator. Friendly and helpful staff at check-in. Great apartment and wonderful view. One bedsheet was a bit unclean and we had to deal with a small ant infestation but other than that everything worked perfectly. Great service! We loved our stay. Everything was perfect for our family of three. The subway and market right off the front door is a must. One little thing: there were a few ants showing up in the bathroom and in the kitchen, so make sure not to leave unprotected food on the counters or floors. The check-in representative took the time to fully explain all necessary information. This is my 3rd experience with Habitat in Barcelona and I don't see why I would go with a different service! I stayed in this apartment with my cousin, Coca and my friend Cristina. We arrived as planned, at 11, but we didn't know that 41 means the no of the apt and the no of the intercom, so while we were waiting for Ramón downstairs, he was waiting for us upstairs. I think you should explain that in future. One day the lift was out of order, I phoned and it was fixed. Another day there was no electricity. I found the fuse box behind the picture. I was explained what to do in good English. Congrats. A nice and comfortable flat (terrace, air conditioning). We appreciated it very much. It was very near from an underground station (very convenient). I recommend it. PL JULIEN . Very good apartment for a couple of people. When we next go to Barcelona we will see if this apartment is available . . . what better recommendation. Très bien ! bien situé et appartement très bien agencé et très fonctionnel Super ! Apartment great for the location. Located near the subway station. Very silent. I recommend it. Nice, modern apartment with sunny terrace. All kinds of amenities were offered like WIFI, wash-machine, dishes washer, tv, kitchen. Good connection to Metro.Check-in was very friendly. - Unfortunately we delayed because the flight was also delaying for an hour, so they charged us also 10 Euro for this delay.air-conditioning program was deleted by the cleaning.Noisy sleeping room in the morning because of the street traffic. in the night artificial lighteninlightening system under the window. //Habitat Apartments comments: We regret any inconvenience due to noise, but the apartment is located in a central area of ​​the city and therefore more likely to be more noise in the street. In Habitat conditions specify that a fee of 10 € will be charged at checkin when not notified in advance of the time delay or not informed of the delay. Apartment in Barcelona with lovely terrace located next to Plaza España in Sants district. For those looking for a place to relax close to city centre. It can comfortably accommodate 4 people.